We explicitly construct all supersymmetric flux vacua of a particular Calabi-Yau compactification of type IIB string theory for a small number of flux carrying cycles and a given D3-brane tadpole. The analysis is performed in the large complex structure region by using the polynomial homotopy continuation method, which allows to find all stationary points of the polynomial equations that characterize the supersymmetric vacuum solutions. The number of vacua as a function of the D3 tadpole is in agreement with statistical studies in the literature. We calculate the available tuning of the cosmological constant from fluxes and extrapolate to scenarios with a larger number of flux carrying cycles. We also verify the range of scales for the moduli and gravitino masses recently found for a single explicit flux choice giving a Kähler uplifted de Sitter vacuum in the same construction. Supernova Search Team collaboration, A.G. Riess et al., Observational evidence from supernovae for an accelerating universe and a cosmological constant, Astron. J. 116 (1998) 1009 [astro-ph/9805201] [INSPIRE]. Supernova Cosmology Project collaboration, S. Perlmutter et al., Measurements of Ω and Λ from 42 high redshift supernovae, Astrophys. J. 517 (1999) 565 [astro-ph/9812133] [INSPIRE]. WMAP collaboration, E. Komatsu et al., Seven-year Wilkinson Microwave Anisotropy Probe (WMAP) observations: cosmological interpretation, Astrophys. J. Suppl. 192 (2011) 18 [arXiv:1001.4538] [INSPIRE]. P. Candelas, X. de la Ossa and F. Rodriguez-Villegas, Calabi-Yau manifolds over finite fields. 1, hep-th/0012233 [INSPIRE]. D. Mehta, A. Sternbeck, L. von Smekal and A.G. Williams, Lattice Landau gauge and algebraic geometry, PoS(QCD-TNT09)025 [arXiv:0912.0450] [INSPIRE]. J. Hauenstein, Y.-H. He and D. Mehta, Numerical analyses on moduli space of vacua, arXiv:1210.6038 [INSPIRE]. D.J. Bates, J.D. Hauenstein, A.J. Sommese and C.W. Wampler, Bertini: software for numerical algebraic geometry, available at http://www.nd.edu/~sommese/bertini. Y.-H. 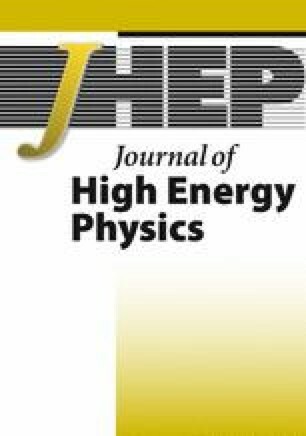 He, D. Mehta, M. Niemerg, M. Rummel and A. Valeanu, Exploring the potential energy landscape over a large parameter-space, arXiv:1301.0946 [INSPIRE].